Roll widths 54in / 1370 mm x 22.8m Roll. 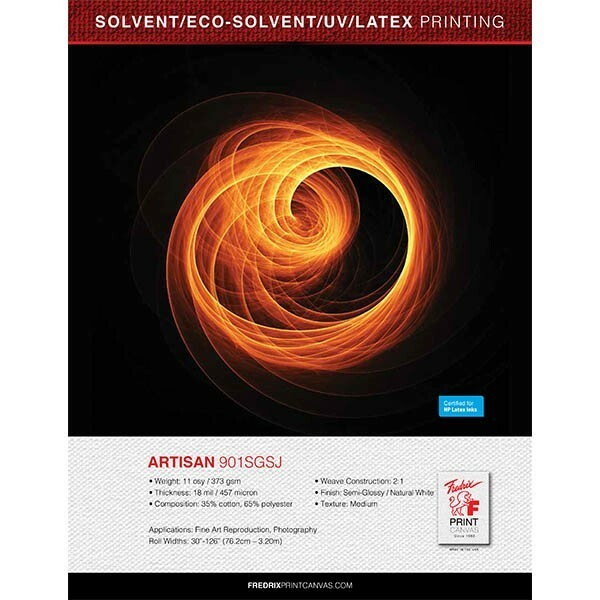 This canvas is designed for digital printing applications using solvent based ink sets. Although designed for all printers using these ink sets, actual results may vary depending on printer model, age, print design, environmental conditions, and other factors. Exposure of a print to atmospheric pollutants, or to temperature, humidity, and / or lighting extremes can result in fading, color shifting, or other visual changes. The ideal conditions for printing and storage are a temperature of 70°F ±5°F and relative humidity of 50% RH ±3% RH The shelf life is 1 year at recommended temperature and humidity.